Walking into a Tuscan space is like being kissed by a sunset and wrapped up in candlelight. 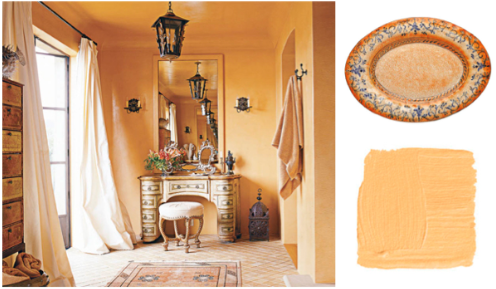 These interiors and their marigold shades never fail to touch my heart and warm my soul. My parents' home was done in this style, so it's also wonderfully familiar and comforting to me. Each time I go home, I'm am delighted by the eloquence with which which their old world decor communicates elegance, maturity, and grace. Of course there is the romance and luxury of it that I succumb to. I am fortunate enough to have a very lovely memory of staying in a bedroom just like this during a weekend getaway to Pienza Tuscany when I lived in Rome. It is one of my fondest memories of my time in Italy. These are grand. The feel of romance and luxury are so inviting. I love how you write that it's like being kissed by a sunset and wrapped up in candlelight. So beautifully expressed and so true. The golden glow is wonderful. Your post makes me think that it has been too long since I have visited Italy and stirs my wanderlust. Also, doesn't that marvelous platter just scream out for homemade pasta and friends to share it with? What a great memory and a beautiful post, love! I absolutely love these photos and Tuscan interiors...so warm and elegant and yet cheerful and comforting. 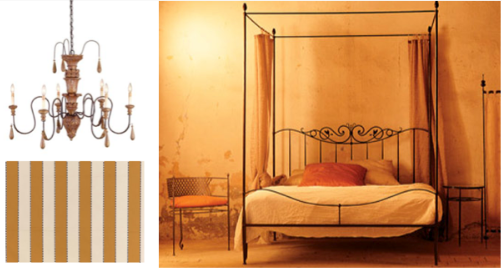 I also love that bed in particular, simple and gorgeous! so lovely it makes me want to be there right now! have a wonderful week! awe! beautiful! I just love this bed!!! Very chic and elegant but still it gives you an impression of coziness. Simply beautiful. I would love it if my apartment looked like this... both of these interiors are incredibly elegant! Especially the first one! Tuscany sounds so nice and these photos are lovely. I may actually be heading there this summer -- my boyfriend's cousin has a villa in some tiny little Tuscan town which is known for its natural hot spring baths. I haven't had a vacation in several years -- I think Tuscany will be exactly what I need. ahh I feel warmer and cozier just looking at these pictures. So breathtaking. Crystal -- this is so beautiful! I really enjoy the rooms you have showcased -- such a sense of warmth and ease...the wall in image 02 is so perfectly patina-ed, as is all of the decor. So timeless and warm. Makes me want to rent Under the Tuscan Sun and fantasize about life in the Italian countryside. Oh i love it! :) Hope you had a Happy Halloween! Nice blog post, Crystal! I really like your layout! lovely post. great way to start the week. These rooms are so breezy and gorgeous, and you are so right when you say that part of their allure is the feeling they bring up in us. Lovely!